We might be officially into Autumn here in Britain but as the sun is still out and leaves are still green then there’s still time for a Summer salad. 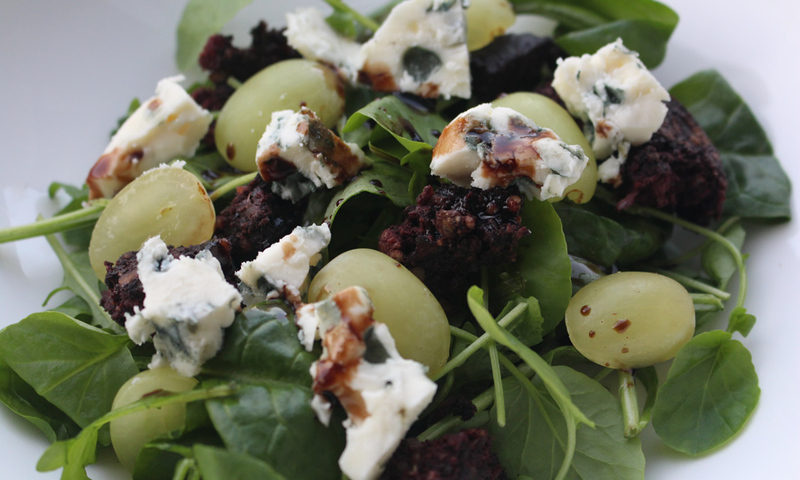 With this recipe I’ve tried to balance all of the different elements together, so you’ve got the salty roquefort, sweet grapes, and earthy black pudding, plus a sweet sour balsamic dressing. Try and use a well aged balsamic vinegar (at least 12 years) for this. It is expensive but you’re not using much and the flavour is well worth the extra money. Cook the black pudding in a frying pan on a medium heat for about 4 minutes on each side (depending on thickness). Once slightly crispy on the outside you can use a wooden spoon to break and crumble it up in the pan, cook for a little longer and remove the black pudding from the pan and set aside. Assemble the salad leaves into two bowls and sprinkle over the black pudding pieces. Using your fingers crumble the Roquefort over the salad as well. Put a frying pan on a medium heat and cut each grape in half, adding them to the pan. This is just to warm them through so should only take 30 seconds to a minute. When warm distribute into each bowl. To make the vinaigrette add 2 tbsp of balsamic vinegar to a small jar and add 1 tbsp of good quality olive oil, sprinkle with a little salt and pepper and shake until combined. Pour over the salad and serve.